As this Ficus tree shows, it’s an arboreal free for all in the jungles of Cambodia. 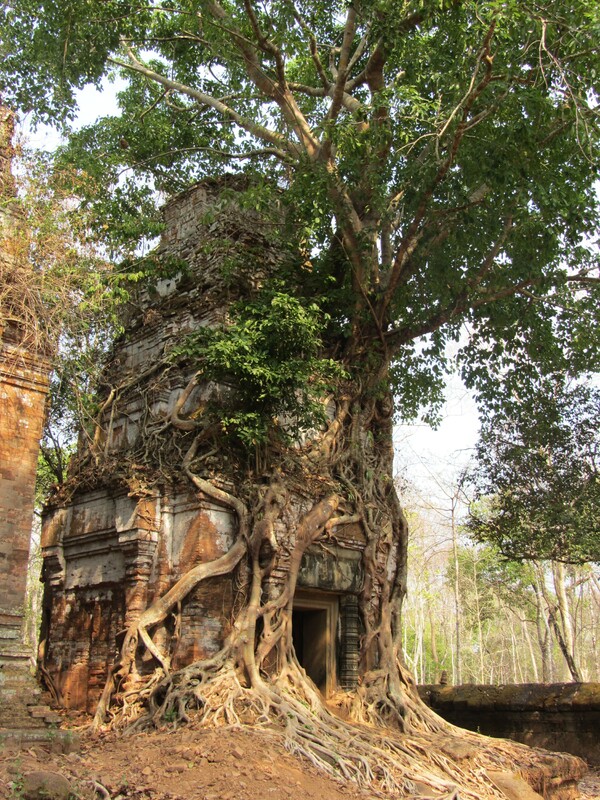 So bring along your torch and compass to explore the Cambodian temple Ta Prohm. Archeologists reckon the temple was constructed sometime between the mid-12th century and early 13th century by King Jayavarman VII, a Buddhist. The Bayon-style temple is dedicated to the mother of the king. Ta Prohm is hailed as the Kingdom of Trees. The Ficus genus includes more than 800 species, many of which produce fig fruit. Fig trees are keystone species in many rainforest ecosystems and nourish a host of animals, including fruit bats, capuchin monkeys, langurs, Asian barbets, pigeons, hornbills, fig-parrots and bulbuls. (Photo by Lynn Koch).